The famous brand Rush celebrates its 40th anniversary, and you can join in as well! 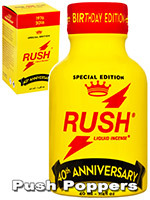 Jumbo Rush Liquid Incense is a Special Edition which contains no less than 40 ml of the very best poppers! 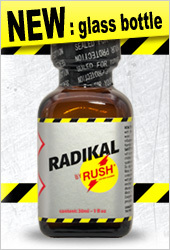 This means that this bottle holds more than four times the normal amount of Rush Liquid Incense, ensuring that you'll have more than enough fuel for your future sexual endeavours. Although the Jumbo bottle may be quite large, its opening is still rather modest, so you don't have to worry about spilling the poppers; Rush really thought of everything! Of course, the poppers themselves need no further introduction - suffice it to say that there's a very good reason Rush has been around for so long... And these poppers may very well be it! Enjoy!